Le Lioran is not a ski resort like any other. 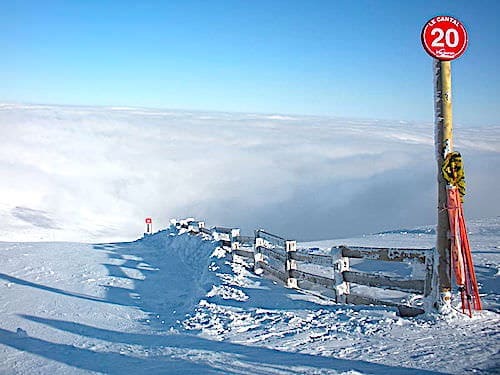 The pistes were indeed opened on the slopes of the Plomb du Cantal, the highest (1855 m) of the extinct volcanoes of Cantal and 2nd highest peak of the Massif Central. Nestled among fir trees, Le Lioran lies in the heart of the Regional Natural Park of the Volcanoes of Auvergne. 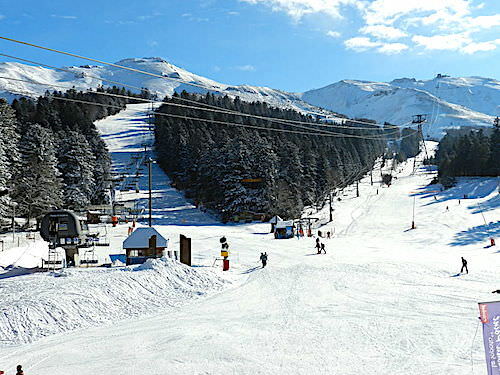 Considered the number one ski resort in the Massif Central, it boasts a 150-hectare ski area that spreads between 1160m and 1850m of altitude. This represents 44 pistes (a 60km network) that ran down the slopes of the Plomb du Cantal and on the neighbouring passes - Col de la Tombe du Père, Col de Part de Bouc and Col de Rombière. Le Lioran’s 10 green, 14 blue, 15 red and 5 black pistes therefore cater for skiers of all levels. 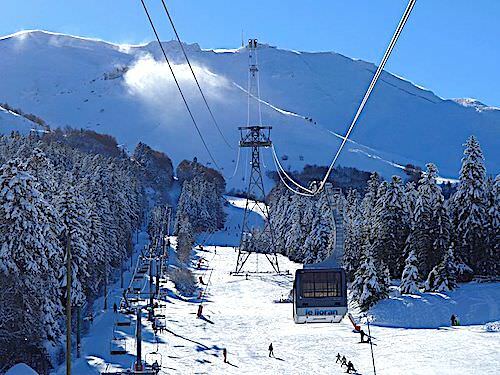 It boasts 22 lifts - 8 chair-lifts, 13 ski-lifts (including 4 telebaby) and a 80-people cable car that takes skiers to the Plomb du Cantal's summit. Many snow cannons provide constant snow cover of the 8 main pistes and beginner slopes. 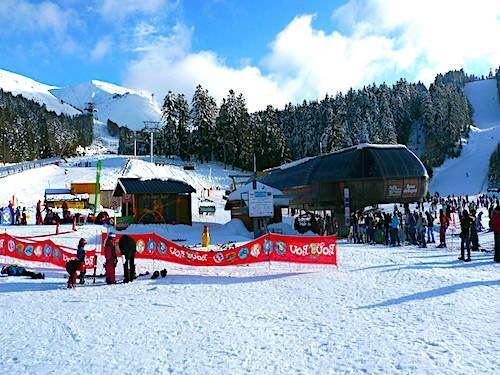 As most other ski resorts, Le Lioran offers also a range of activities such as snowmobiling, tobogganing, snowshoeing or dog sledding, devalkart and the must-have ice rink to name the main ones. Finally, Le Lioran is the only station in Europe directly accessible from a railway station. The ski resort is open from mid December to early April (dates obviously vary slightly depending on the snow report). The historic village of Lioran lies below the Route Royal 126. This road, built in 1789 and mainly used by military troops, connected Montauban to Saint-Flour via the Col de Fond de Cère (1296m). It replaced the Via Celtica, the old Roman road that traversed the Cantal Mountains via Col du Père (1586m). However, Route 126 was exposed to blizzard and snowed up from October to May. It was as dangerous the rest of the year, as travellers were subjected to highwaymen and wolves attack! People therefore preferred to use the old Via Celtica, which, although at a higher altitude, was more secure. The construction of a road tunnel was therefore essential. This tunnel was put into circulation in 1847; it was then the first tunnel in France and the longest in the world (1414m). But above all, this road tunnel (which operated until 2007) allowed access to Le Lioran throughout the year. That said, Le Lioran’s real expansion took place in the 1860s, when the railway tunnel and station were built. Skiing was not yet fashionable, but many affluent tourists came to enjoy the village’s fresh air. A hotel infrastructure was developed to offer quality accommodation. Thus appeared in 1896 the Hôtel Daude, and in 1898 the Hôtel de la Compagnie d’ Orléans (demolished in 2010). 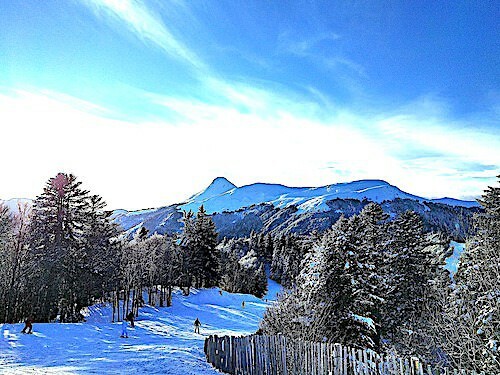 Ski appeared in Auvergne at the turn of the 20th century and the first skiers discovered Le Lioran in 1906. Le Lioran is therefore proud to be the pioneer of the Auvergne ski resorts. Le Lioran Ski Club was founded in 1908 with the help of the Touring Club and Compagnie d'Orléans, and had a hundred members! Several competitions took place in 1910 and 1911. The ski resort developed steadily until the outbreak of WWII, then resumed in 1947. The first two ski-lifts were indeed built in 1947. Some 20 years later, the President of the Regional Council promoted the resort's further development. In 1965 thus appeared three new ski-lifts - La Gare (station that still works), La Familiale and Remberter. However, the resort's real expansion took place with the commissioning of the Plomb du Cantal 8-people cable car. The then Prime Minister George Pompidou, a native of Cantal, inaugurated it in 1967. The future President of the Republic saw all his life to the development of the resort and its installations. Le Lioran has never stopped expanding since, and has become the most important ski resort in the Massif Central. SAEM Super Lioran Développement, whose main shareholder is the General Council of Cantal, has managed the station since 2006. 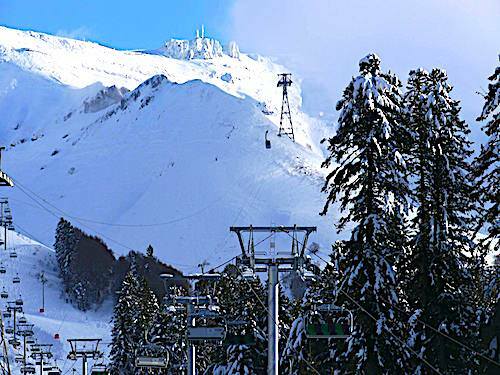 Le Lioran is definitively an exciting ski resort to discover; who doesn’t dream of skiing on the slopes of a volcano (even extinct)?